Both a gory monster movie and a Twilight Zone-styled morality play on mob mentality and religion run amok. 126 min. Dimension Films. Director: Frank Darabont. Cast: Thomas Jane, Marcia Gay Harden, Laurie Holden, Andre Braugher, Toby Jones. Frank Darabont (The Shawshank Redemption, The Green Mile) returns to the Stephen King well for a third cinematic adaptation. This one's the nastiest, subjecting the Rockwellian town of Castle Rock to both a gory monster movie and a Twilight Zone-styled morality play on mob mentality and religion run amok. It's hardly a recipe for subtlety, but Darabont works over the audience with plenty of skin-crawling horror, not all of it emergent from inhuman monstrosity. The ostensibly simple story finds a sturdy ensemble of archetypal small-town folk cowering in a supermarket, awaiting whatever will emerge from a town-blanketing mist. Natural leaders emerge in artist David Drayton (Thomas Jane)—who's responsible first and foremost for his nine-year-old son (Mason Gamble)—and unassuming supermarket clerk Ollie Weeks (Toby Jones), who turns out to be a crack shot with a pistol. In King's allegory, two diametrically opposed alpha personalities challenge David and Ollie's influence: lawyer Brent Norton (the great Andre Braugher) and God-fearing Mrs. Carmody (Oscar winner Marcia Gay Harden). Norton refuses to believe the mist cloaks a mortal threat (from "Planet X," as he sarcastically puts it); he preaches rationality while Carmody preaches Biblical chapter and verse to suit every occasion. To the credit of King and Darabont, even the characters we know are wrong or those from whom we're constitutionally inclined to recoil are allowed, like a broken clock, to be right once a day. Still, Carmody is likened both to Jim Jones and Castro in the space of a few minutes, and her raving invocations of evil "stem cells and abortion" as contributors to the town's plight and her call for mortal "expiation" can only be heard as wacky. Sadly, Carmody isn't so much of a cartoon, just one of those extraordinarily self-righteous folks that come out of the woodwork to exploit fearful situations. Even among the more conventional heroes we find the old debate over human nature. The pretty schoolteacher (Laurie Holden) who finds herself by Davids side insists, "People are basically good, decent," while Ollie retorts, "As a species we're fundamentally insane. Put more than two of us in a room, we pick sides and start dreaming up reasons to kill one another. Why do you think we invented politics and religion?" Such moments recall Rod Serling's 1960 Twilight Zone episode "The Monsters Are Due on Maple Street," except King's monsters aren't only infections of the mind, but also corporeal creepy-crawlies. David ironically speculates at picture's beginning that the mist's source might be "two fronts meeting," and there's a palpable red state-blue state divide here (each side feeling mocked and threatened by the other). In opposition to Carmody's social conservative is a dyed-in-the-wool liberal little old lady (Frances Sternhagen) who bemoans "corporate handouts and building bombs" being prioritized over education. With a trio of soldiers two weeks from shipping out from the nearby base, there's also a military secret-project paranoia that yields an intriguing science-fiction tease. In large part, King and Darabont simply explicate the debilitating effects of panic. An on-the-fly shooting style—accomplished by the team behind TV's The Shield—contributes to the tension by adding immediacy to the old-style monster movie (The Birds comes to mind more than once, as well as the less refined creature features of the '50s). With a fraction of the budget but a maximum of cast and crew talent, Darabont trumps Spielberg's bloated War of the Worlds, a story that—once upon a time and in good hands—was a panic-starter of its own. 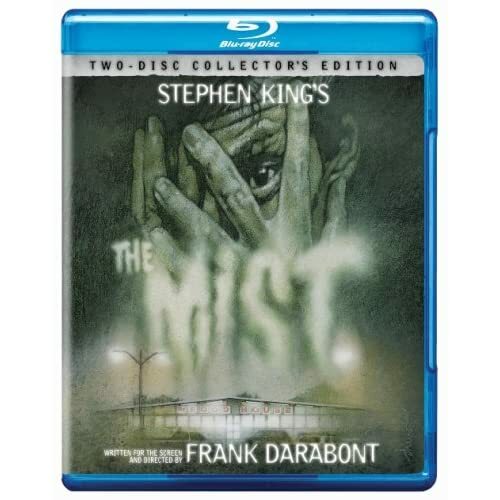 No doubt about it: The Mist gets the deluxe treatment on Blu-ray and DVD, with a two-disc edition that includes two presentations of the film and exhaustive bonus features. Aside from the theatrical version, screenwriter-director Frank Darabont has elected to include (on disc two) his "preferred" director's version, in glorious black and white (the cut of the film is exactly the same: 126 minutes). In his "Introduction" (3:18), the ever-enthusiastic Darabont explains the origins of this version in comments made by author Stephen King, and describes how each provides a unique viewing experience: the theatrical version more of a '70s horror vibe versus the preferred version's '60s horror feel. The excellent transfers capture the film's look and sound as seen in theatres and as envisioned by Darabont, respectively. The color rendering on the theatrical version resembles the '50s palette I remember from seeing the film in theatres, but seems a bit pumped up, with somewhat unnatural flesh tones; the new black and white version is more satisfying, anyway. A chatty screen-specific commentary by Darabont accompanies the theatrical version on disc one. And the more recent Blu-ray edition includes an exclusive bonus feature that should be trumpeted as such on the packaging: "A Conversation with Steven King and Writer/Director Frank Darabont" (12:17). The pair's mutual admiration and nerdiness are endearing as they trade stories and questions. The centerpiece bonus feature is the documentary "When Darkness Falls: The Making of The Mist" (37:28), whch explores the film's origins, production demands and design, casting, approach (Darabont having previously directed an episode of The Shield, he poached their DP and camera operators), the literal making of the mist, how much of a ball Darabont had making the film, and the controversial ending. Participants include Darabont, Stephen King, Thomas Jane, Laurie Holden, Marcia Gay Harden, Toby Jones, Andre Braugher, Jeffrey DeMunn, William Sadler, Frances Sternhagen, Mason Gamble, Sam Witwer, Alexa Davalos, Buck Taylor, Robert Treveiler, production designer Greg Melton, director of photography Rohn Schmidt, editor Hunter Via, first assistant director K.C. Colwell, and co-producers Denise Huth, Anna Garduño and Randi Richmond. "Taming the Beast: The Making of Scene 35" (12:12) details the six-day shoot of the ten-minute supermarket invasion sequence, adding comments by camera operators Bill Gierhart & Richard Cantu, special make-up & creature effects supervisor Greg Nicotero, and visual effects supervisor Everett Burrell. Next up is "Monsters Among Us: The Creature Effects of The Mist" (12:48), with fresh contibutor concept design artist Bernie Wrightson. This one focuses on creature design, while "The Horror of It All: The Visual FX of The Mist" (16:05) focuses on execution of the creature concepts. New contributors here include compositibg supervisor Tom Williamson, digital compositor Votch Levi, animation supervisor James Starus, and CG supervisor Akira Orikasa. Here, Darabont also takes the viewer from raw footage to an intermediate step to a final shot. Among the other cool extras: eight "Deleted Scenes" (14:49 with a "Play All" option): "Steph Says Goodbye" (2:08), "After the Loading Dock" (2:05), "Carmody's First Speech" (1:52), "Carmody and Amanda" (3:02), "Norton Holds Court" (1:15), "Hattie and David" (2:15), "Jim and Myron" (1:08), and "Confronting Jessup" (1:07). "Drew Struzan: An Appreciation of an Artist" (7:30) introduces us to the poster and cover artist responsible for capturing some of the most indelible Hollywood images (he also provided David Drayton's art for the film); an enthusiastic Darabont and Guillermo Del Toro testify to Struzan's talent, and the man himself speaks up. Three "Webisodes" (10:17 with a "Play All" feature) add behind-the-scenes detail: "Day 10: Earthquake" (3:18), "Day 18: Burn Man" (4:02), and "Day 34: Franny, The Flamethrower" (2:58). Lastly, you'll find a "Trailer Gallery" with the "Original Theatrical Trailer" (2:31), "Trailer #2" (2:33), and "Trailer #3" (2:19). All site content © 2000-2019 Peter Canavese. Page generated at 04/23/2019 01:35:50AM.